For one reason or another I haven’t been the kindest person lately. I feel like judgement stems from comparison. Comparing yourself to someone else. Comparing your friends to other people or even comparing experiences you’ve had with one person to experiences you’ve had with another. It doesn’t help you, it won’t help them and you really aren’t achieving anything other than a negative attitude. You are your own person. Be your own person. Comparing yourself to someone else isn’t going to help you. You don’t need to do something that is as good as your friends, siblings or any other person for that matter. What you do yourself is enough. I know in life things get busy sometimes you fall off the rails and bad habits slip in. For me that is where I am at right now. I get frustrated and rather than trying to find a solution to my frustration I get moody. It isn’t attractive and what is worse is I am the one who allows it to happen. I have developed a chip on my shoulder. I get frustrated by what is happening in my life. The way some people treat me, where I am at with my career, what I would like to be doing. I can’t change the way people treat me but almost every other area of my life is something that I can work to change. It might not be a quick fix but no matter what is happening in your life there is always another option. You may have to think outside the box but squares are kind of ugly anyway. Go explore other opportunities. While frustration is something I can completely relate to don’t allow your frustration to condone a negative attitude. Yes you can’t avoid being frustrated but turn your frustration into determination and you anger into kindness. Put out to the universe what you would like to receive yourself. This is quite self explanatory mean people are mean for a reason. They suffer from internal conflicts and look to ease these conflicts externally. This isn’t an excuse for them but show them the love they so longly desire. With enough love, support and kindness maybe they too will want someone else to experience happiness and share their good fortune with someone else. This one is sort of about judgement but it is also about being kind to everyone because we really do have no idea what is going on in other peoples lives unless we take the time to ask them about it. People can fake a smile and seem fine but dig a little deeper and you realise there’s a lot you can hide behind a facade. This is about team work and taking every opportunity that presents itself. I believe every interaction you have with a person is an opportunity. You have the choice to make the most of the situation. Open your mind, open your heart give a little of you mind and heart but take as much mind and heart as you can when it is offered to you. We can learn a lot from other people and their experiences. To sum up today’s learnings be kind to everyone. 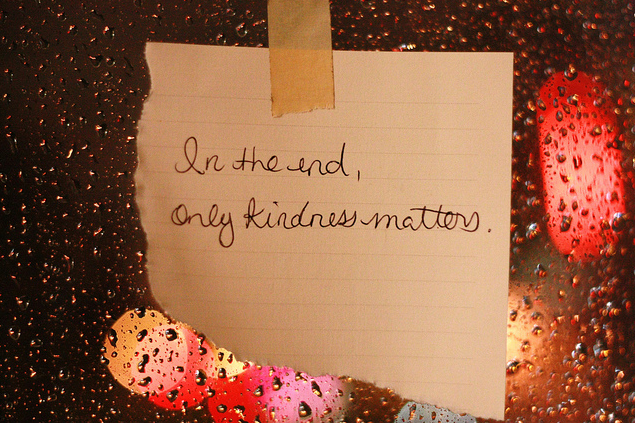 Be kind to everything. Think kind thoughts and most importantly act with kindness. I truly believe in putting your best foot forward and being guided in the best direction. Do to others as you would have them do to you. If you feel the negativity rising this week ask yourself is this kind? If the answer is no find an alternative solution. Explore solitude, spread kindness and experience happiness. Wow! This blew me away Cam! You have such strong , meaningfulness , kind words!